Our research-backed outlines & study tools help you optimize your study time by focusing on the highly tested MEE & MBE topics and rules. We are experts on the bar exam and have invested thousands of hours analyzing past exams and testing patterns to discover the subjects, topics, and rules that are most important to the bar examiners. We have meticulously catalogued these topics & rules into High/Medium/Low categories, so you can easily see what’s highly tested and prioritize your studying. Simply put, we help you invest 100% of your study time on the topics that are most likely to show up on your exam. There’s no need to stress. With our help, you can say goodbye to that endless mountain of information and hello to a succinct, highly effective study process. Pre-Order the July 2019 Priority Outlines Now! The updated July 2019 UBE (MEE+MBE) study materials will be released sometime between mid-May and early-June (depending on when the most recent exam is released). Click here to be notified when the July 2019 study materials are released. If you purchase the current Feb. 2019 version now, we will automatically send you the July 2019 version for FREE when it is released. Contains ALL 570 rules tested in the last 48 MEE exams (Feb. 1995 to July 2018). Charts each rule’s Frequency, and lists the specific exams the rule was tested. Provides a Priority Rating (High/Med/Low) for each rule – so you can see the most important rules at a glance. Includes model rule statements to ALL 570 rules tested in the last 48 MEE exams (covering 352 essays over 24 years). PLUS, additional rules are included for the six MBE subjects that have only been tested on the essays since July 2007: Contracts, Constitutional Law, Criminal Law & Procedure, Evidence, Real Property, and Torts. Is written so it’s simple to understand with important legal phrases, concepts, and terms emphasized. Provides the detail required to adequately answer an essay question. Is organized how the bar examiners test rules on the MEE essays. Includes MEE Tips in the right sidebar – these provide tips and insights on how the MEE tests certain topics and when to apply certain rules on the exam. Now that you have a guide for your studying, it’s time to dive in head first. Use our Condensed Attack Sheets – to help you quickly memorize the important rules and topics. 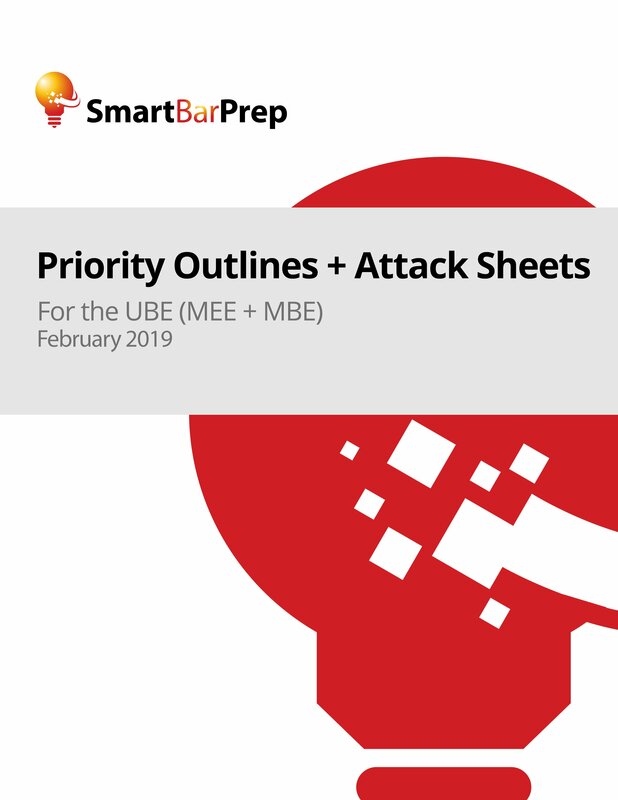 Our attack sheets are specifically designed to be used for both MEE & MBE studying, and are perfect for memorization in the weeks and days leading up to the exam. They allow you to quickly condense rule statements into clusters, helping you spot and analyze issues likely to be tested together. Is sorted from most to least tested, both overall and within each subject area. 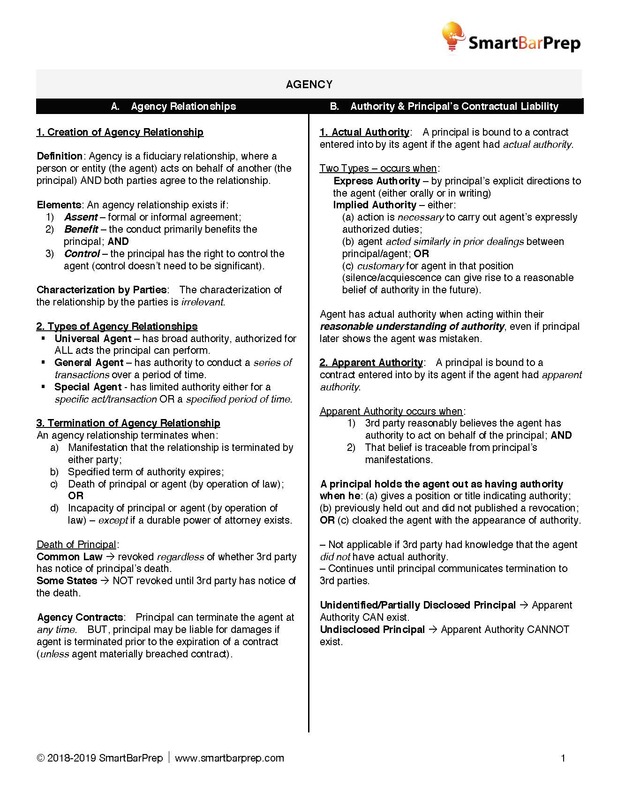 Can be used as a checklist to make sure you’re studying all of the important rules. Contains cross-references to the page numbers where the rules appear in the Essay Priority Outline. 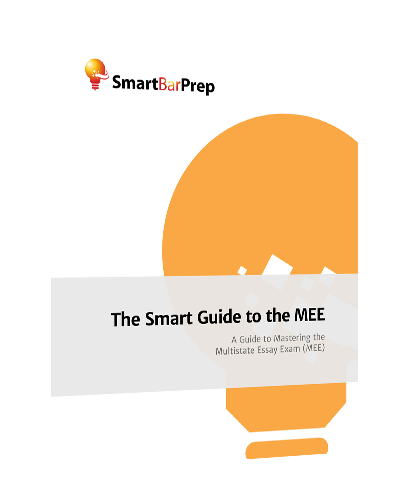 A study guide that simplifies and explains how to prepare for the Multistate Essay Exam (MEE), with tips, strategies, and step-by-step approaches to maximize your score. 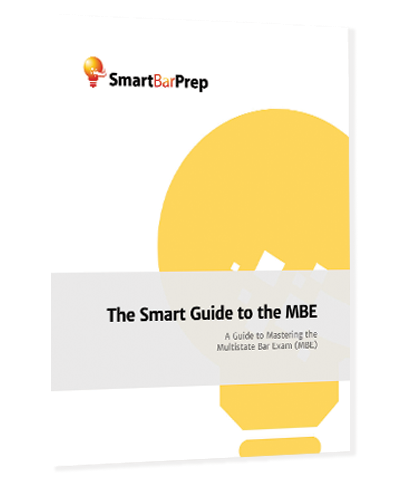 Our Smart Guide to the MBE breakdowns and explains exactly how to prepare for the MBE section of the bar exam, including the study method the creator of SmartBarPrep used to score a 171.1 on the MBE (top 5%)! These flash cards are the perfect tool for memorizing complex laws on the go. These digital flashcards are downloadable in PDF format, and instructions are included to load the flashcards onto your phone or tablet (i.e. iPhone, iPad, or Android device). The Perfect MEE Practice Materials. Studying the law isn’t enough to do well. You also need to practice. We have licensed real MBE and Essay Questions used on past exams so you can perfect taking the exam before you step foot in the exam room. Don’t wait. Optimize your studying today with our Smart Study System. If after reading through our outlines and study guides, you aren’t happy for any reason, just email us within 30 days of purchase and you’ll receive a full refund. We obviously don’t think it’ll come to that, but if you’re even the least bit worried, then put your mind at ease. The problem with most preparation materials is that they don’t do enough hard research using ACTUAL exams. The typical bar exam outline or study guide tells you every rule imaginable but does not provide any clear guide as to what rules matter most. It got us thinking…could we do better? Our answer, SmartBarPrep’s Essay Priority Outline, is based on the analysis of past Uniform Bar Exam/Multistate Essay Exam (UBE/MEE) essays. It would take you over 1,000 hours of reading, analyzing, compiling, and drafting to equal the information at your fingertips in our outlines and study guides. The National Conference of Bar Examiners releases past exam questions along with student answers for each question approximately 3 months after the exam. This has allowed us to compile statistics from the last 48 UBE/MEE Bar Exams (February 1995 to July 2018) by analyzing every issue and rule that was tested. 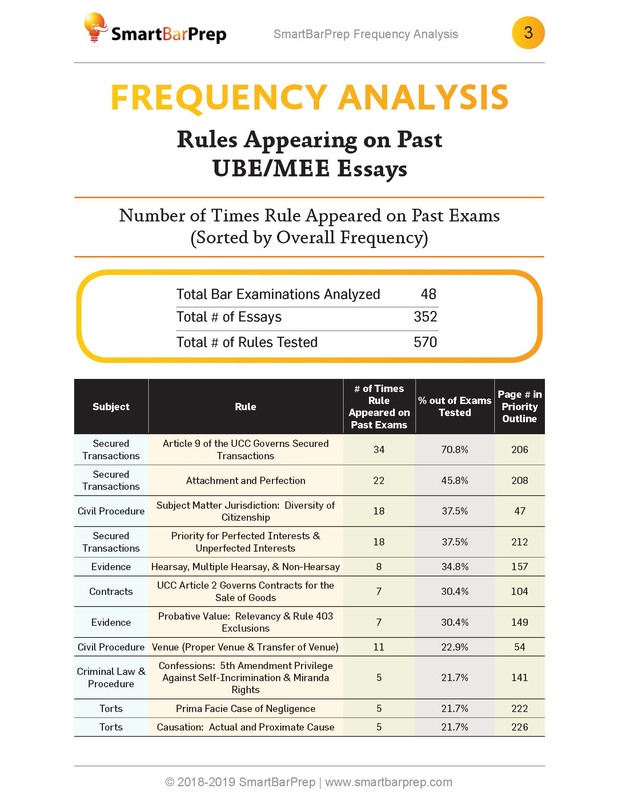 Every topic tested on the UBE/MEE Bar essays is compiled here! We are a firm believer in the 80/20 Rule developed by Italian economist Vilfredo Pareto. In short, the rule says that in almost anything in life, only a few things (the 20%) are essential, while the rest (the remaining 80%) are trivial. 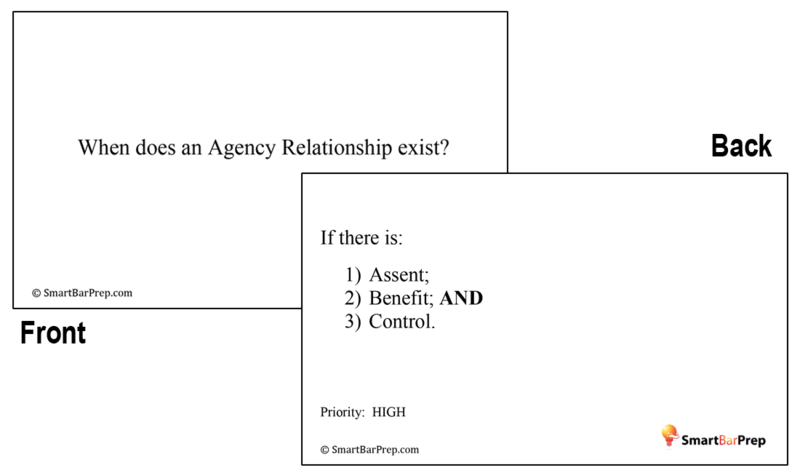 After thousands of hours in review, the SmartBarPrep team proved that this rule can be applied to the bar exam. In line with the 80/20 Rule, patterns emerged. The most noticeable was that the bar examiners tested some material more frequently than others. For example, whenever a Civil Procedure question appeared on the UBE/MEE, we found that approximately 40% of the time a component of the question dealt with the “Subject Matter Jurisdiction: Diversity of Citizenship” rule. Since this rule is tested frequently, it makes sense to spend more time memorizing it than, say, the rule for Depositions, which appeared only once in the last 20+ years. Also in line with the 80/20 Rule, focusing 80% of your time and energy on the 20% of the rules of law that are tested most frequently will maximize your chances of passing. Don’t just work hard; work smart by focusing on the right things. That is exactly what our study materials do: They show you what is most important and where to focus your efforts. 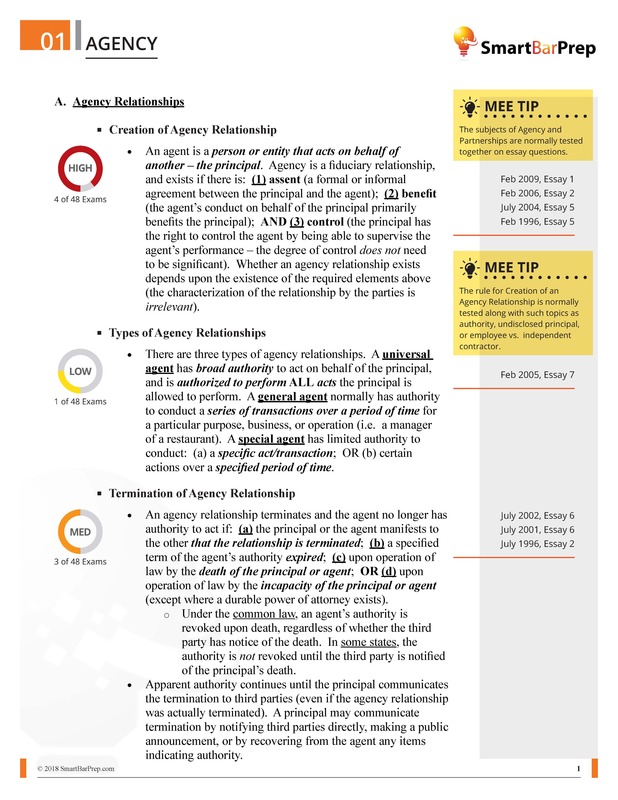 *86.5% of the rules tested on the July 2016 MEE were contained in the July 2016 SmartBarPrep Essay Prep Outline, as the outline contains additional rules for the six traditional MBE subjects (Contracts, Constitutional Law, Criminal Law & Procedure, Evidence, Real Property, and Torts) since these subjects have only been tested on the essays since July 2007! Are You Ready to Study Smarter? And it’s all in a concise format that keeps you focused and organized. While our study guides are intended to be your go-to resource for passing the bar, they are also designed for integrated use along with popular courses like BarBri, BarMax, and Kaplan. The SmartBarPrep Essay Priority Outlines and study tools integrate well with review courses because each is arranged in terms of frequency and topic, saving you the hassle of trying to figure out which rules are the most important to study. SmartBarPrep has helped thousands of examinees pass the bar exam since 2011! “I used Smart Bar Prep for the February bar. I think the outlines were AMAZING. I am awful and reading hundreds of pages and watching 50 hours of video hoping to pull out the rule. Smart Bar allowed me to maximize my time and memorize exactly what I needed to know. I have recommended this program to everyone I know who’s taking the Bar. I highly, highly recommend this program, whether it’s for first time Bar takers or repeat takers. Thank you for your hard work in compiling the rules. This program is worth every penny and more.” Kayla P. University of Maine School of Law (Passed Feb. 2018 Maine Bar Exam [UBE format]). Sure… you can see samples of our bar exam study materials here. What bar exam States / Jurisdictions can SmartBarPrep be used for? Yes… If after reading through our outlines and study guides, you aren’t happy for any reason, just email us within 30 days of purchase and you’ll receive a full refund. We obviously don’t think it’ll come to that, but if you’re even the least bit worried, then put your mind at ease. When will the July 2019 materials be released? If I buy the Feb. 2019 materials now, will you send me the July 2019 materials when they are released? Yes. If you purchase now, you will receive the Feb. 2019 version immediately. We will also send you the July 2019 materials for free as soon as they are released. All of our outlines, study guides, and flashcards are an instant digital download in PDF format. Unfortunately, we do not provide any materials in hard-copy paper format. However, there are no restrictions on printing, so you would be able to print the outlines and study guides yourself. You can use any PDF reader software to view the PDF files. If you need a PDF reader software, you can download Adobe Reader for free here. Can I print the outlines? Yes, there are no restrictions on printing out copies of the materials for your personal use. What is the access period (how long can I access the materials)? All of our study materials are delivered in standard digital PDF format. Once downloaded, you can use the materials as long as you wish. However, the link to download the materials usually expires at 6 months from your purchase (for security reasons) – we can reactivate the download links in certain circumstances if you email us. That is why we suggest that you download the materials on your computer or device. Immediately, since the files are downloadable. After your purchase, you will be emailed a unique link to access and download the files. What is the UBE, MEE, MBE, and MPT? The UBE is developed by the National Conference of Bar Examiners (NCBE), and currently used by 31 bar exam jurisdictions. It is uniformly administered, graded, and scored by user jurisdictions and results in a portable score that can be transferred to other UBE jurisdictions. The MBE is a six-hour, 200-question multiple-choice examination. Every jurisdiction uses the MBE (except for Louisiana and Puerto Rico) as part of their bar exam, including all UBE jurisdictions. What is the Multistate Essay Exam (MEE)? The MEE consists of six 30-minute essay questions. Currently, 38 jurisdictions use the MEE as part of their bar exam, including all UBE jurisdictions. What is the Multistate Performance Test (MPT)? The MPT consists of two 90-minute performance test items. SmartBarPrep currently does not offer study materials to prepare for the MPT section.